tl;dr - | ✭✭½✩✩ | This book was ok. I didn't find it particularly scary, and I definitely don't understand why its going to be a series and not just a single book. Perhaps had it been just a single book, it would be a bit better. I don't know, but I won't be reading the next book. I listened to this as an audiobook. Description (from Goodreads) For sixteen-year-old Dan Crawford, New Hampshire College Prep is more than a summer program—it's a lifeline. An outcast at his high school, Dan is excited to finally make some friends in his last summer before college. But when he arrives at the program, Dan learns that his dorm for the summer used to be a sanatorium, more commonly known as an asylum. And not just any asylum—a last resort for the criminally insane. As Dan and his new friends, Abby and Jordan, explore the hidden recesses of their creepy summer home, they soon discover it's no coincidence that the three of them ended up here. 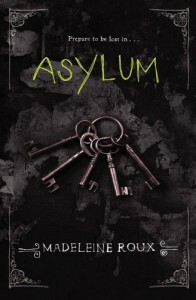 Because the asylum holds the key to a terrifying past. And there are some secrets that refuse to stay buried. So, this was only my second foray into the world of horror books. I love horror movies, and scary stories, and so I figured I should really check out more horror novels. Yeah... this book wasn't scary to me. Don't get me wrong, I have kind of a ridiculously high tolerance for all things scary. But I can usually recognize when a thing is in fact creepy and would scare someone who hasn't spent as much time in the world of creepy as I have. This book... I don't think it would be all that scary to someone who gets scared easily. Anyways. So Dan goes off to this summer camp thing that is basically like, a trial summer college course. Each week they choose new topics and go to those college classes and basically get a feel for what college will be like. Though it sounds like there wasn't enough stress when choosing classes, because let me tell you - that was always an issues at my college. Anyways. Dan meets Abby and is instantly smitten, and jealous when Abby calls over her friend Jordan who, it turns out, is gay. Gotta have a token gay character or a token minority. Just wouldn't be right if you didn't. Anyways. Jordan just seems to be a cliche gayboy, kind of mean but not really and full of sassy comebacks and gay quips. I don't know, I didn't really like his character. Abby... was the artsy type. I had to think about that. Abby the character is kind of forgettable, but her story isn't. Which is weird. I remember her story quite well - she goes into the locked office with Dan and Jordan and sees a picture of this creepy little girl who was lobotomized (or something) and is haunted by the image. Other stuff happens, but that would be spoiler material. But basically, thats all I really could remember. She doesn't really seem to have much of a personality... I'm not sure. She was completely forgettable. Most of the characters were, really. And Dan. Weirdo loaner Dan. Because of course Dan is a lone wolf type. And then he gets bunked with an odd duck of a roommate. I was really confused about that part actually, because I could never remember his roommates name. And his roommate goes from like some super smart Sheldon Cooper-esque character, to all the sudden being a pushup obsessed meat head who spends all his time at the gym. So that was really confusing. And I guess should've represented something being wrong with him? But I don't know, he wasn't really fleshed out and Dan didn't really like hanging out with him once he found Abby and Jordan. But yeah. The pacing on this story was a little slow, and maybe with the weird pictures to accompany the chapters like it has in the book, the audiobook was lacking a little bit because I didn't have those creepy images in front of me to accompany the story. But if you have to rely on cheep tricks like that, then I feel like you're not anywhere near Stephen King's writing level and may never be. (To be fair, I haven't read any Stephen King novels, so I don't know if he has images accompanying his stories, and I'm going on the people I know who have read his books and said they were absolutely terrifying.) So yeah... Overall. I didn't really find this book scary, though it was a little creepy at the end, and it definitely is not a strong enough story with strong enough characters to keep me reading through an entire series.